The government passed the controversial ‘teabreaks’ legislation only a few weeks ago and already Unite Union has caught an employer using this law as an excuse for ill-treating their staff. Yesterday a union member, who prefers to remain anonymous for fear of retribution, emailed Hotel Organiser Shanna Reeder. The new law actually will only come into effect in March 2015, however it seems this misinformed employer has jumped at the opportunity to stop workers having their breaks. Unite Union will also be writing to the employer involved to inform them that they have breached current employment law and that they are expected to abide by current legislation at all times. If the employer does not rectify this immediately we will re-consult with the workers involved to determine what action they prefer in order to get a fair resolution. The government’s changes to the employment laws are designed to weaken workers bargaining power – at both the individual and collective level. The old law required an employer with a collective agreement in place to employ new staff on the terms of the collective for the first 30-days. This was seen as protecting the collective from being undermined by employing new staff on inferior conditions. With only 9% of the private sector workforce in unions , only a minority or workplaces in the private sector will have collective employment agreements. 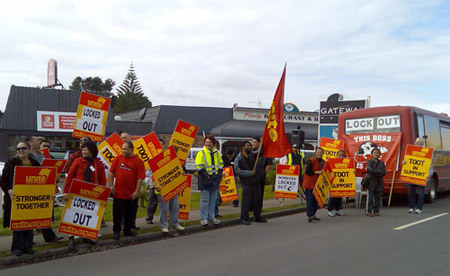 Even where they exist, like in the fast food industry where Unite has half its members, we often only have a minority or workers as members because the industry is 24-7 in small sites scattered across the country with a 100% annual staff turnover and usually with hostile owners. This is hard to do in a minimum wage industry. It has been hard to move companies off that rate as a start rate. However we have succeeded in getting some steps built into the agreement for after six months or one year. A real danger would exist if a company offered staff a start rate that was higher than the collective but without some of the service steps that would apply later. 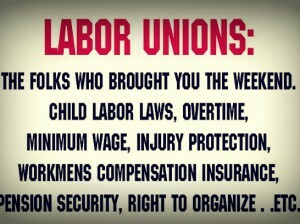 Workers would be tempted to take the higher rate and not join the union and therefore the collective. The current legal right to a 10-minute paid break for shifts of two to 6 hours and a second plus a 30 minute unpaid break for shifts of four or more hours is being removed. The worker also loses the right to nominate that the shifts are spread evenly through their shifts. The employers obligation now is simply “provide [you] with a reasonable opportunity for rest, refreshment, and attending to personal matters” that is “appropriate for the duration of [your] work period.” When these breaks are taken is by agreement or failing that at the employers discretion. When an employer feels they can’t provide you with a break (or you agree) then they must compensate you for the loss with at least an equivalent. Luckily nearly all the Unite Union collective employment agreements have the old legal requirements incorporated in them. In addition our agreements have a paid 15-minute break rather than the 10 minutes that had been in the law. But it has been a fact of life that it is difficult to enforce the agreements around breaks because workers are made to feel they are letting the team down if (as is often the case) the shop or workplace is understaffed. By making it a law in 2008 it gave workers more courage to assert their rights. One small positive aspect of the new law is the assertion of the need for some sort of at least equivalent compensation if you miss your entitlement. In the past many workers will have worked through their paid breaks without compensation but now there is an obligation on the employer to at least provide equivalent paid time off. We actually had one employer argue in the employment authority that because workers were paid when working through their paid break there was no disadvantage.